Eltronicschool. 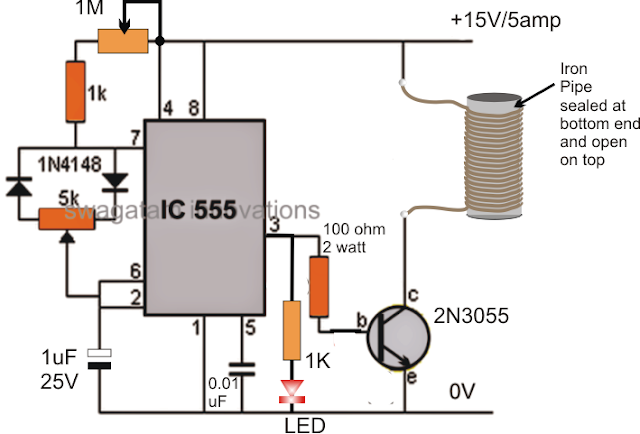 - This is one application of ordinary 555 IC for generating pulse (PWM) easily. Output of this pulse will be used to trigger NPN transistor for induction heater. In this time, based on NE555 iC as PWM generator, we will give you one of electronic circuit schematic of Small Induction Heater using NE555 IC for School Project like in Figure 1. below. Circuit schematic like in Figure 1 above is Small Induction Heater using NE555 IC for School Project. So, for you who want to build your self school project for heater generator, you can use this circuit as your reference. This circuit using major component as the ordinary IC NE555. According HomeMade-Circuit site describe the working coil here is made by winding around 50 turns (not critical) of 1mm super enameled copper wire over a fabricated iron pipe whose dimensions may be selected as per individual preference, and could be anywhere between 10 to 20 cm in diameter and 30 to 40 cms long. Once the above set up is built and switched ON, the coil and the iron pipe could be seen developing heat gradually, and anything placed inside the pipe could be witnessed getting heated up. If it's water inside the pipe, then it could begin warming up and even reach the boiling point if the coil is optimized correctly through the frequency and PWM adjustments. The idea behind this small induction heater circuit is simple, it is to force the iron pipe atoms to electromagnetically oscillate at an incompatible frequency resulting in the production of huge amounts of opposing eddy currents and a proportionate amount of heat due to this opposing current in the metal.